The ‘Maquette’ auto rigger I developed during the production of Recore for Armature Studio. This modular auto-rigging system enabled me to iterate quickly and efficiently as well as create very unique character, creature, and mechanical control systems for the project. The system is written in Python and used in Autodesk’s Maya DCC software. The basic structure of the Maquette system is modular so that any style of character, creature, and or mechanical system could be created. Underneath the rig created is a network core node system which allows other tools and systems to transverse the rig to find any components within it to access for procedures and or modification. This tool was used in regards to the automated rigging system I had written to allow the tech artist to load layout joint files, save layouts to xml, modify controls on a character rig and their settings, create / load / save a bind file with skeleton hierarchy and skinned geometry, load a complete character rig, and build a character rig from the saved layout and bind file. This tool allowed the tech artist to load layout skeleton templates for various modular pieces of a rig and also assign the meta-data associated with the joints that the rigging system would use to build components and controls for the final character rig. This tool allowed the tech artist to mirror layout joints from one side to another. This also retained any meta data that the layout joints would have from one side to another for the Maquette rigging system. 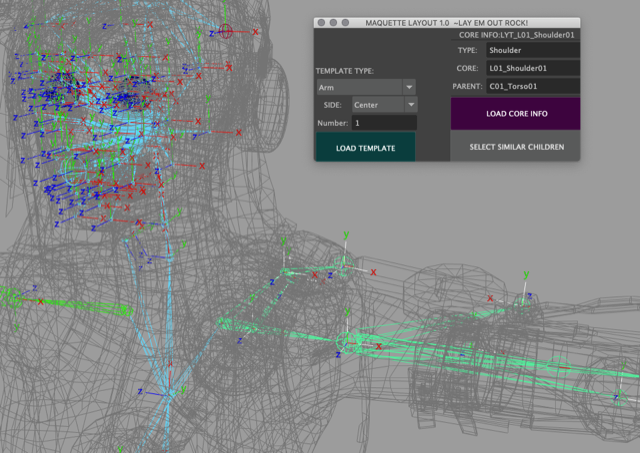 This tool allowed the tech artist to save poses for facial expressions on the character rig and connect it to the facial controls. It allowed the creation of new controls and adding / connecting poses to each controls various regions. It also is able to mirror facial poses from one side to another to author facial poses per side. The facial animation system was built in a way where facial geometry was bound to joints that were then connected to controllers. 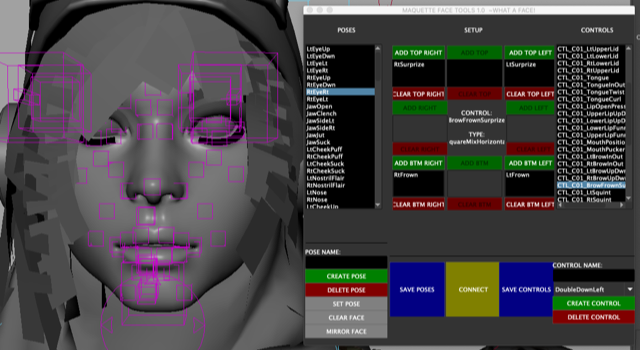 Facial poses were then saved as deltas of the controls in a nodal system within the character rig.